Sherlock reconsiders his relationship with his sponsor, Alfredo, while he and Joan search for killer who is murdering unsuspecting drug mules. Watch Elementary Season 3 Episode 21 online to find out who the killer is. Sherlock observes someone who doesn't belong at his support group meeting. He confronts him and "Lloyd" leaves. Two paramedics are killed and a woman kidnapped outside a hospital. Sherlock identifies the killer, Wallace Turk, through a previous case. He confesses to the murder, but he lied. The victim's body was still warm when the police find her. When the ME examines the body, he discovers she was missing organs that were taken days before her murder. Sherlock suspects she is a drug mule. Maggie recently returned from Brazil where she supposedly underwent gastric bypass surgery, but Joan believes the surgeon instead placed drugs inside of her. Janko, a Serbian drug lord, is working out of a dentist's office. He strikes a deal with the police so they can arrest the "surgeon". Meanwhile Sherlock tracks down Lloyd to find out why he is spying on him. He is not spying on Sherlock, but his sponsor, Alfredo. Joan is nervous about the meet between Janko and the surgeon, but before it happens, Janko is shot and killed. Dr. Ward, the dentist, confesses to his murder under duress and will give them the "surgeon" if they grant him immunity. Who is the surgeon? Why is Lloyd following Alfredo? Watch Elementary Season 3 Episode 21 to find out the answers. 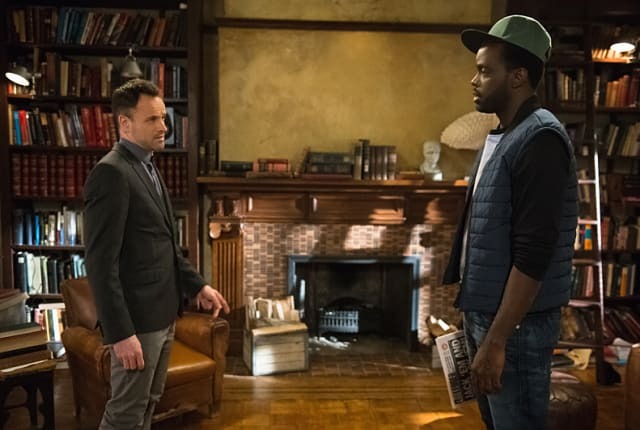 On Elementary Season 3 Episode 21, Holmes and Watson investigate when two paramedics are killed and another is kidnapped. Holmes finds out upsetting news about his recovery sponsor.